By now, you know that iTunes is a feast for the ears, but did you know that the Snow Leopard’s iTunes Visualizer provides you with eye candy as well? With just a click or two, Snow Leopard lets you view mind-bending graphics that stretch, move, and pulse with your music. iTunes can display some awesome patterns! Choose View→Show Visualizer (or press Command+T). Immediately, most of your iTunes interface disappears and begins displaying groovy lava lamp-style animations (like, sassy, man). You can also change the viewing size of the iTunes visuals in the View menu. From the View menu item, choose Full Screen (or press Command+F). To escape from the Full Screen mode, click the mouse or press Esc. To stop the visuals, choose View→Hide Visualizer (or press Command+T again). The usual sunny aluminum face of iTunes returns. You can still control iTunes with the keyboard while the visuals are zooming around your screen. 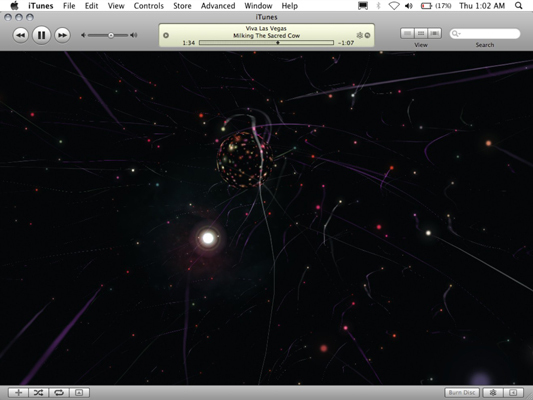 The iTunes Visualizer has many hidden features. While viewing the Visualizer, press ? to see a list of hidden Visualizer settings. Additionally, you’ll find third-party Visualizer plug-ins available for downloading on Apple’s Web site and other Mac-related download sites. Heck, some even display lyrics, karaoke-style! Choose a different Visualizer plug-in from the View→Visualizer menu item.